Our Gyratory Sieve Shaker can take up to seven sieves of 200 mm diameter. The sieves table is inclined to the vertical axis and the direction of inclination changes progressively, in a clockwise direction. 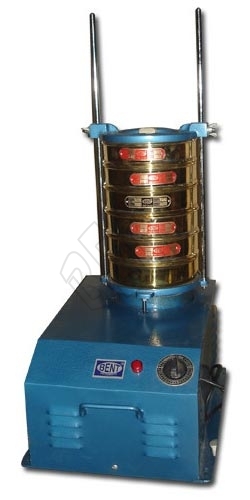 In addition to the gyratory motion of the table, there is an upward & downward movement, ensuring that each square centimeter of the sieve is utilized. The whole gear mechanism runs in grease.